Ludhiana the legendary city that gave India Martyr Sukhdev, located in the old banks of Sutlej was our second stop en route Ladakh. The land of five rivers gave us an amazing and wonderful opportunity to relive our good old college days we headed to the "Museum Of Rural Life Of Punjab," which is in the Punjab Agricultural University campus. This wonderful two storied museum gave us an comprehensive tour of amazing culture and glorious past of Punjab. The artifacts include archaeological treasures from Harappan, Aryan, Gupta and Medieval antiquities in terracotta, specimens of old coins and seals. The false ceiling inside the museum is from the 18th Century. The other galleries exhibit pottery, kitchen utensils, murals, farming equipment, musical instruments, spinning and weaving, ornaments and jewelry. A massive traditional cot and huge trunks for storage are the highlight of the museum. The best part was amazing black and white pictures of each item were placed right besides the artifact giving visitors a clear understanding of it's usage.Visiting hours if from 9 am to 5 pm and entry ticket is priced at Rs.10. "Dr. Uppal Museum." that showcases water and power resources of Northern India. The model here depicts the rivers, irrigation system, roads, railways, the evolution of Himalayan rivers. A large model of Punjab and neighboring valley have been depicted in open air outside the museum. The construction of the model inside the museum involved 900 topographical sheets and the location of about one lakh elevation points by the team of workers involved in building the model. Entry ticket is priced at Rs.5. The model also depicts the salt flats, Tibetan plateau, salt range and Indo Gangetic plains. We fell in love with the university and spent several hours here. We had lunch in one of the many student canteens. Piping hot masala maggie, huge plate of veg manchuria and a big glass of lassi in all just costed us Rs.95. We sat in the lawn and enjoyed unending conversations. The massive university campus was very clean. It is a bird watchers paradise and we spotted a flock of grey hornbill which is a rare sight even in National Parks. Early mornings one can rent bicycles and take a spin around the campus for Rs.30 per hour. Gur mandi market in Ludhiana is a shoppers paradise. Lanes and by-lanes are dotted with shops selling anything and everything and then there is always plenty of street food. It looked like you can walk into any shop and try your hand at any north Indian delicacies. We in particular liked Chawlas. Craving for Italian food the perks of a good city offered us "Colonial Resto Cafe" in Sarabha Nagar, pakhowal road. We ordered the penne pasta in red sauce which was very well done. The best dish was their spicy shredded chicken which was not too fiery and the chicken was beautifully cooked with a blast of flavors. The crunchy bell peppers and diced garlic added a good punch. We checked into Hotel Mirage the hotel offers spacious rooms, clean sheets and comes with all modern amenities. What we really liked about this hotel was their excellent service quality. The staff were very courteous. The only drawback being it is a little in the out skirts. In our case since we were on our bike commuting was not an issue. The hotel is opposite Bhai Wala Gurudwara in Daad village. If you are on a road trip to this part of India be very careful, unfortunately like most other parts of India, people do not follow traffic rules and regulations. One over speeding car almost took us out in one of the narrow lanes of Ludhiana. Road-trips are our personal favorite and guarantees ultimate fun, adventure, lot of flexibility and freedom. But at the same time, there is lurking danger and very serious threat to life and property if you are not cautious or want to be over adventurous. Just a second of lapse in concentration could result in disaster. 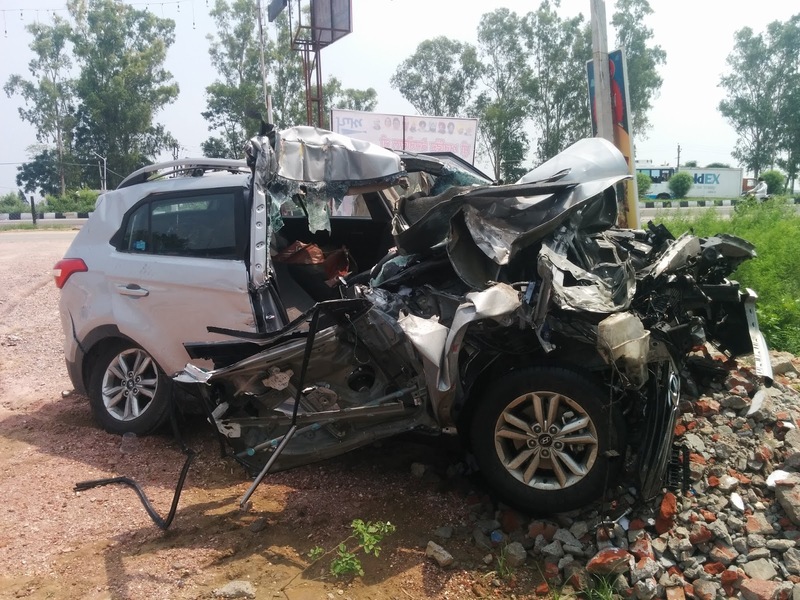 We saw several mangled remains of vehicles all along the highway but a gut wrenching moment was when we stopped for one of our chai breaks and saw a Hyundai Creta totally mangled and smashed. Looking at the car, we could guess what could have happened to the driver and passengers and for a second we could feel the chills in our spine. While on the highway always be focused never ever over speed, try and avoid driving or riding after sunset. Machines can be dangerous as well if not handled well. Also, a few moments of unwanted adventure or heroism on the road could turn out to be disastrous and unfortunately in some cases it might drag innocent victims too in this misadventure. To avoid such bone chilling consequences and to ensure not just ones safely but also safety of other on the road it would be best to follow the law be well within the speed limit, alert at all times and above all respect the machine. Your train or flight tickets can always be rescheduled whatever maybe the cancellation charges or loss, it is not worth risking your lives. Always remember the motto should be "Leave early, ride slowly and reach safely."